A Press briefing issued some days before Rayner’s speech. This is presumably the source of the TES report of 23 September , which claims to be reporting what her speech will say, though in fact there are significant differences. The ‘PLP Briefing: Schools Policy Announcement – Angela Rayner Conference Speech 2018’, a 15 page document sent to MPs ‘From the office of Angela Rayner MP, Shadow Secretary of State for Education’ and dated Monday 24 September 2018, the day of her conference speech. It gives far more detail than Rayner’s speech but doesn’t seem to be publicly available. Some of the formulations in these three sources differ or are imprecise. Together they outline a policy process over the five years of a Labour government, beginning with some interim measures while ‘a new regulatory framework’ is finalised and put in place. 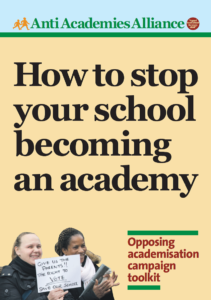 Existing academies, including free schools, will remain, but their powers will be reduced. The PLP Briefing says that ‘the reformed MATs …would be subject to a common set of rules, set by statute.’ The ‘common set of rules, set by statute’ presumably includes the curriculum, though this isn’t stated. In her Conference speech Rayner said ‘Our National Education Service will … take power from corporations and hand it to communities.’ Presumably she was referring to power at school level but she did not say that democratically constituted school governing bodies would be restored. Nor did she give a time-scale. The TES 23 September, claiming to be reporting in advance what her speech would say, quoted Rayner as saying ‘The next Labour government will give power back to communities so that our schools are run by the people who know them best – parents, teachers and local communities.’ But actually she didn’t say this in her speech. The TES 26 September , presumably referring to a press briefing, said ‘Labour’s briefing added that the party would “transfer responsibility for decision making and budgets back to schools, requiring every school to have a governing body of democratically elected parents, teachers, other school staff, community representatives, and to consult on any major changes in school policy or governance before they are introduced”.’ These words are not in the PLP Briefing for MPs, nor in the Conference speech. These are interim measures, intended as the preliminary stage in a process of transition to ‘a new regulatory framework’ for all state-funded schools. This ‘new regulatory framework‘ is the most controversial element in Rayner’s new policy agenda. Q: Will all new schools be maintained schools? Here local authorities are defined in terms of their role of ‘school improvers’, and it is envisaged that other bodies, such as ‘cooperative schools’, could take on that role. It is not spelled out what ‘responsive to communities and subject to democratic oversight and accountability’ means. What is a ‘school improver’? The major issue of concern in Rayner’s policy proposals is the role envisaged for the local authority. It will now be given responsibility for admissions policy and the provision of school places (in addition to its current statutory responsibilities). The local authority will also have a role as a ‘school improver’, but it would have no privileged responsibility in this respect, it would have equivalent status to other ‘school improvers’ such as the reformed MATs. They would include the corporate chains if they continue in existence and choose to continue to offer support to schools, presumably on a fee-paying basis. The term ‘school improver’ signals an intended continuity with the ‘standards’ agenda that has dominated government school education policy under the current Tory government and its Coalition and New Labour predecessors. Schools have been judged by government performance measures, incentivised by rewards and punishments and policed by Ofsted. ‘School improvement’ has been the name of the game. Rayner’s Conference speech and PLP Briefing represent a continuation of this policy, not a break from it. The fact that they make no mention of the need to reform Ofsted is symptomatic. Absent from this perspective are two crucial and inter-related policy elements. One is a wider, progressive and inspiring vision of education, its aims, content and processes. The other is the unique status of the local authority as the elected representative of the whole local community (unlike any other ‘school improver’ body), and its role of developing that wider vision of education in collaboration with all the stakeholders in the local school system: parents, teachers, young people, school governors, other agencies including early years providers and social services, further and higher education institutions, and employers. The fundamental principle should be that every citizen has a stake in, and therefore should have a voice in, their local school system as well as their local school. Only an elected local authority can fulfil the role of making that possible. Fourth is a curriculum that emphasises connectedness. For Fielding and Moss, the local authority ‘should have responsibility for the education of its children, indeed more broadly for the relationship between its children and the community. This does not mean going back to a situation where local authorities manage schools directly. Schools should be democratically managed in a system of governance marked by decentralisation and widespread participation, by children and adults, teachers and parents, school and local communities.’ (p123). On that basis ‘local authorities define a local cultural project of education for their community, a collective vision for the area, in relationship with schools, local communities and citizens…’. (p124). Of course there are many other aspects of a progressive local vision for education in addition to the curriculum. One of the most important concerns tackling the pervasive social inequalities that characterise local authority areas and are represented differentially in the populations of their schools. English education policy has always tolerated, and has recently promoted, a diversity of school types. Around this demographic and institutional diversity form local patterns of educational advantage and disadvantage. Rayner’s proposals would have the effect of confirming rather than disrupting these patterns. (Her failure to give any commitment to abolish grammar schools – they aren’t even mentioned in her speech or in the PLP Briefing – is further evidence.) One of the key responsibilities for which a local authority is necessary is to promote policies and mobilise actions to tackle these social and institutional inequalities in the local school system. For Fielding and Moss, ‘the development of radical education and the common school needs to go hand-in-hand with the renewal and development of democratic local government, which in our view has to include an active and innovative role in education.’ (p127). The theme of democratic participation in the public sector and in the economy is now Labour Party policy, most recently developed in the Consultation Paper ‘Democratic Public Ownership’, published in September 2018. 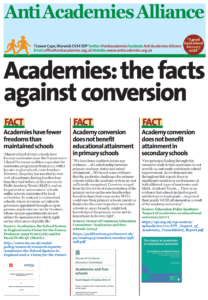 Its arguments are very relevant to the education role of local authorities. Democratic participation can enhance the effectiveness of publicly owned enterprises by tapping into grassroots forms of knowledge from the direct experience of employees and users of public goods and services. Active and broad-based participation of workers, community members, and other stakeholders can deliver better outcomes by utilising the practical knowledge of those groups regarding operating conditions on the ground. There is a … question about how professional experts with the relevant technical skills manage and run an organisation effectively while also allowing genuine democratic citizen engagement. An organisation, and indeed sector, should be run by the people who have the experience, skills, knowledge, and competence to do this. However, this is always a collective learning process and is done best where the considerable diverse knowledges of the workforce and citizenry are brought together to inform the decision-making process. Nor does democratic participation in local education policy-making imply that public views are inevitably progressive. In both cases it is a question of deliberation and negotiation among public and professionals, and the mobilisation of collective popular and professional support for progressive policies. A progressive and participatory local school system requires of course proper funding for schools and local authorities. In her Conference speech Rayner promised ‘Our National Education Service will … reverse the cuts’, but she gave no commitment about how much funding will be increased by and over what time-scale. Local authorities have been cut back to the bone. 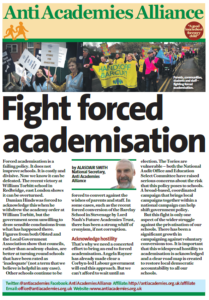 They need their funding restored to previous levels, including funding to enable headteachers and teachers to give time to share their expertise with other schools and with the local authority itself.